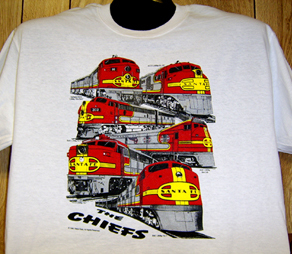 Atchison Topeka & Santa Fe Railway was and always will be the Route of the Warbonnets, The Super Chief and the Chiefs. With the famous Warbonnet paint scheme, the Santa Fe is still recognized the world over. Individual marks are licensed marks owned by BNSF Railway Company and are used under an active license agreement. One of the Santa Fe Railways last group of Diesels purchased before the BN merger were these SD75s in beautiful Warbonnet paint scheme. 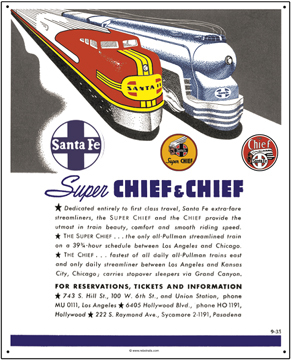 Featuring the Atchison Topeka & Santa Fe Railroads famous Super Chief logo used in ads and as the drumhead on the Chicago to Los Angeles transcontinental passenger train, The Super Chief. Nothing could be finer. Santa Fe cab units in beautiful warbonnet paint schemes. Note how some are different, like the ALCO DL109 nose that does not have the red inside the logo, the only diesel to be so painted. Warbonnet diesels from ALCO, Fairbanks-Morse, EMC and EMD. Beautiful reproduction of an advertisement ran by the AT&SF Railroad promoting its Super Chief and Chief transcontinental passenger trains. 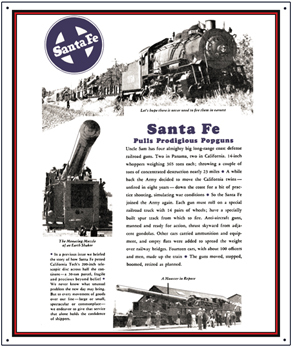 Reproduction of an advertisement used by the Santa Fe Railway boasting about its movement of the Military's big coastal gun. Interesting ad. Gun looks like it was taken from a Battleship. 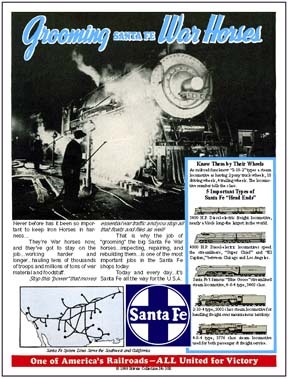 Reproduction of an advertisement used by the Santa Fe Railway boasting about its steam War Horses on duty throughout World War II. 6 inch x 6 inch square tin logo sign of the Chicagoan Drumhead of the Atchison Topeka & Santa Fe Railway. 6 inch x 6 inch square tin Chico in sand logo sign of the Santa Fe Railway. 6 inch x 6 inch square tin drumhead logo of the CHIEF transcontinental passenger train of the Santa Fe Railway. 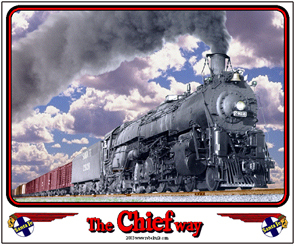 6 inch x 6 inch square tin Chief Way logo sign of the Santa Fe Railway. 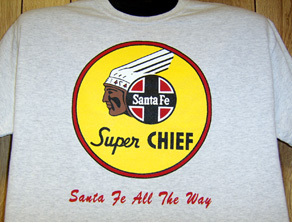 6 inch x 6 inch square tin Big Chief with SF logo sign of the Santa Fe Railway. Beautiful Santa Fe passenger diesel class PA built by ALCO, The American Locomotive Company. Many consider the PA series to be the most beautiful diesels ever built. 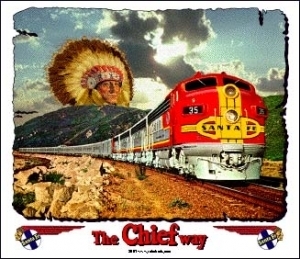 Beautiful Santa Fe passenger train in the charge of a warbonnet EMD passenger F-unit diesel. Some consider the Warbonnet paint scheme the most beautiful to ever grace a diesel locomotive. 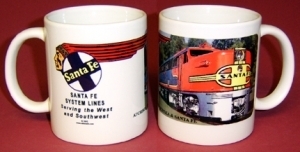 Santa Fe coffee mug featuring its historic circle logo over the paint scheme of its Warbonnet diesels. Beautiful Santa Fe passenger train traveling through the Great American Southwest pulled by an ALCO PA diesel with two horseback riders admiring the beautiful Super Chief. Beautiful Santa Fe passenger train traveling through the orange groves of California heading east towards its transcontinental destination of Chicago. Several of the lines logos are on the reverse side of the mug. 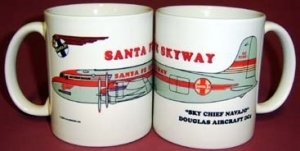 The Atchison Topeka & Santa Fe Railway operated a fleet of Douglas DC3 and DC4 aircraft known as Santa Fe Skyway until the government forced them out of the airline business. Colorful coffee mug featuring a beautiful Santa Fe steam locomotive pulling a long freight through the American Southwest. 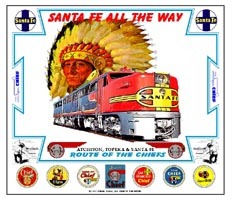 Santa Fe Railways famous Super Chief transcontinental flagship passenger train inaugurated in 1937 as the Nations first diesel powered streamliner. 6 inch x 6 inch square tin of the last EL Capitan logo used by the Atchison Topeka & Santa Fe Railway used until the end of passenger service on the Santa Fe. 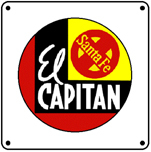 6 inch x 6 inch square tin of the original EL Capitan logo sign of the Atchison Topeka & Santa Fe Railway. 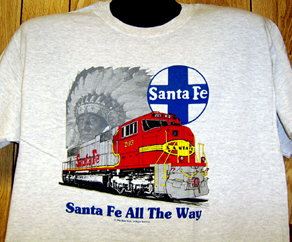 This version preceded the red, black & yellow logo used until the end of passenger service on the Santa Fe. 6 inch x 6 inch square tin Golden Gate drumhead logo sign of the Atchison Topeka & Santa Fe Railway. 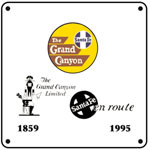 6 inch x 6 inch square tin Grand Canyon drumhead logo sign of the Achison Topeka & Santa Fe Railway. 6 inch x 6 inch square tin Kansas City Chief drumhead logo sign of the Atchison Topeka & Santa Fe Railway. 6 inch x 6 inch square tin Kansas Cityan drumhead logo sign of the Atchison Topeka & Santa Fe Railway. 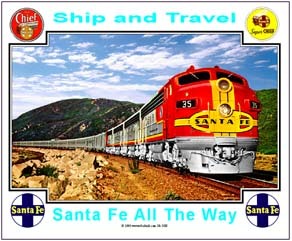 Mouse Pad featuring the Santa Fe Super Super Chief pulling into the Albuquerque Station bustling with folks waiting to board. Passengers detraining will probably dine in the famous Harvey House Diner in the station. 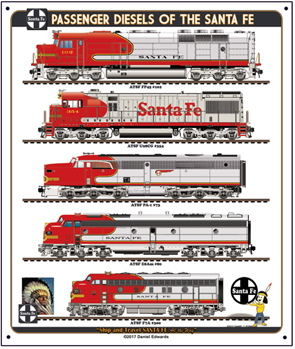 Santa Fe mouse pad with the Big Chief looking over a beautiful PA diesel along with images and logos of the Atchison Topeka & Santa Fe Railway. Mouse Pad with a beautiful F-unit diesel pulling the transcontinental Super Chief passenger train across Americas Great Southwest on the Chief Way line. 6 inch x 6 inch square tin sign/plaque Ranger drumhead logo of the Santa Fe Railway. The Ranger passenger train operated between Galveston, TX and Chicago, IL. 6 inch x 6 inch square tin San Diegan drumhead logo sign of the Achison Topeka & Santa Fe Railway. 6 inch x 6 inch square tin San Francisco drumhead logo sign of the Achison, Topeka & Santa Fe Railway. 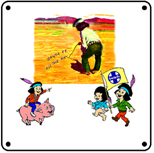 6 inch x 6 inch square tin logo sign of the Atchison Topeka & Santa Fe Railways Chico mascot used extensively for over 50 years, honoring its Southwest heritage. The tune Chico is singing is from a radio ad. 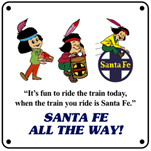 Features a Santa Fe Trailways Bus emblem used on drivers caps and lapel pins. A very rare image. 6 inch x 6 inch square Grand Canyon Limited image used by the Atchison Topeka & Santa Fe Railway to promote its line into the Grand Canyon. 6 inch x 6 inch square tin logo sign of the Atchison Topeka & Santa Fe Railway. 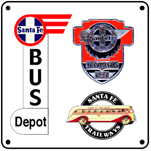 6 inch x 6 inch square tin logo sign of the Atchison Topeka & Santa Fe Railways bus division known as Santa Fe Trailways. A bus depot sign, a bus logo and a bus drivers cap emplem are included on this informative sign. 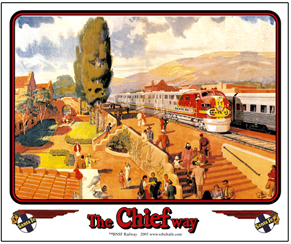 6 inch x 6 inch square tin Every Inch The Chief logo sign of the Achison Topeka & Santa Fe Railway. 6 inch x 6 inch square tin The Oil Flyer drumhead logo sign of the Santa Fe Railway. 6 inch x 6 inch tin sign of the Achison Topeka & Santa Fe Railways purple Super Chief Drumhead that preceded the yellow version. Drumhead is on the "Navajo" observation car in 1937. Photo courtesy of a Santa Fe fan. 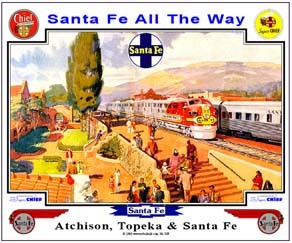 6 inch x 6 inch tin square logo sign of the Achison Topeka & Santa Fe Railway. Was used in print advertisements and on the original blue and yellow FT diesels. 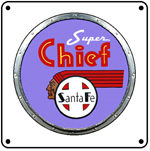 6 inch x 6 inch square tin Super Chief drumhead logo sign of the Achison Topeka & Santa Fe Railway. Tin Sign Santa Fe Albuquerque Station stop for the Chicago bound Super Chief. 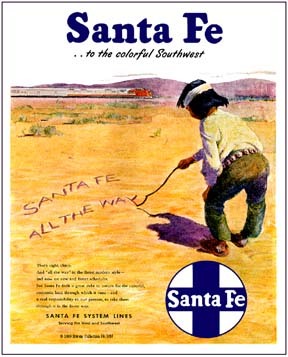 Reproduction ad of the Santa Fe Railways Chico, little Indian Boy writing that famous saying in the sand- Santa Fe All The Way! Tin Sign Santa Fe Chief rolling through a western America canyon with sheep and herder in the back ground. A beautiful image of times gone by. 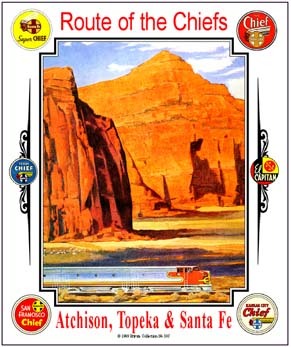 Tin Sign Santa Fe Super Chief in the mountains for Arizona, rolling to its on time destination. A publicity photo used on the AT&SFs annual report. 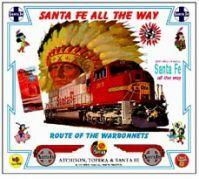 Even non-Santa Fe fans will love this sign... what is more beautiful than the AT&SF Railroads famous "Warbonnet" paint scheme on every diesel they owned, and they are presented here in a Daniel Edwards masterpiece.